The greatest sign I've ever seen anywhere in the world. This was one of the days I was most looking forward to on the trip. The Hanshin Tigers may not have the raw popularity of the Yomiuri Giants, but they’ve definitely got the most rabid fanbase in the entire country. 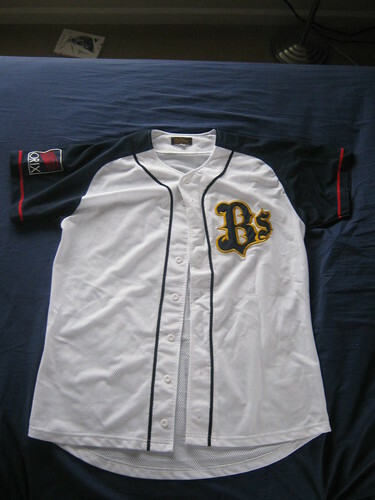 Beyond that, Koshien Stadium is said to be the “soul of Japanese baseball,” most likely because, beyond the already crazy Tigers that play there, everything from college games to the high school championships are housed within Koshien. It’s a storied stadium most often compared to Wrigley Field or Fenway Park here in the States. A statue-type thing in the open-air vendor area outside of Koshien. We’re not ready to get too far into that yet, I’ve still got a little bit of Kyoto to cover before we got on the train to head for Nishinomiya. 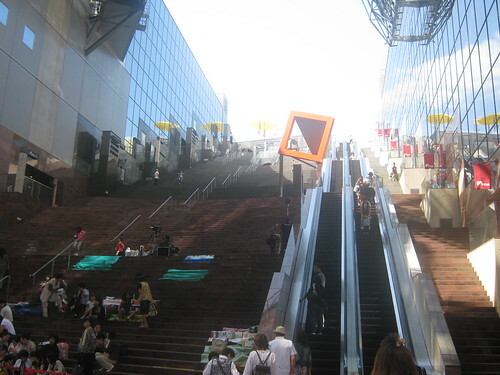 My morning was mostly occupied with wandering around the Kyoto station area to check some stuff out. 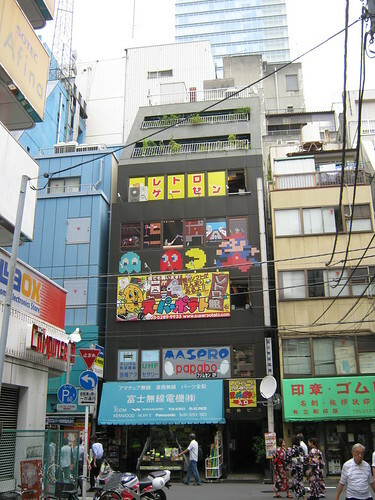 I started out with going to the local Bic Camera to check out the games in stock. It turns out that quite a few others had the same idea, as there was a queue outside the shop just before the shop opened at 1000 that morning. Maybe they're trying to get some shopping in before the work day starts? Out of curiosity, I asked about the availability of the new Pokemon games that had come out the day before. They were predictably completely sold out. Browsing the shelves, I found a copy of a game I’ve been wanting to import since I played Elite Beat Agents, Osu! 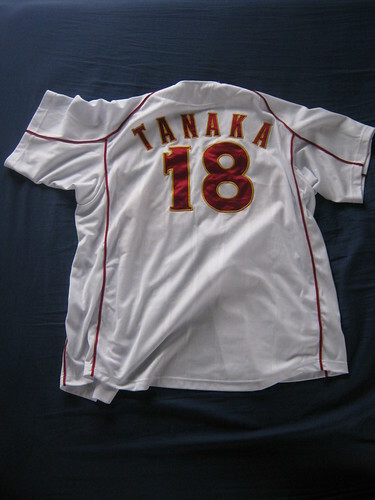 Tatakae! Ouendan. The sequel was nowhere to be found, but I definitely picked up the game to play during my downtime on the tour. 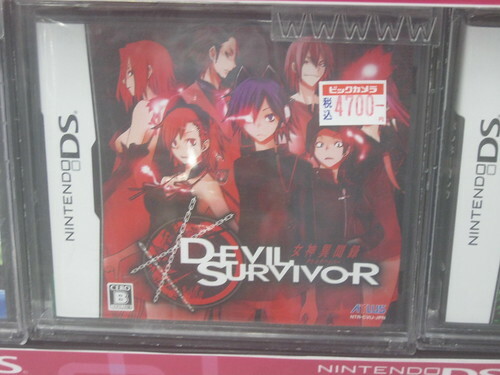 Not Ouendan, but the Japanese boxart of the game I played the most in Japan, Shin Megami Tensei: Devil Survivor. The US boxart is near identical, the only difference is the placement of the title to accomodate the ESRB rating. My need to browse video games now sated, I headed into The Cube to take a look around and grab breakfast. I spotted a Mister Donut, one of the more famous donut shops in Japan, and I decided that I would break my Western food boycott for the morning to sample this Japanese take on an American staple. Boy was I surprised when I spotted the donut you see below this text. 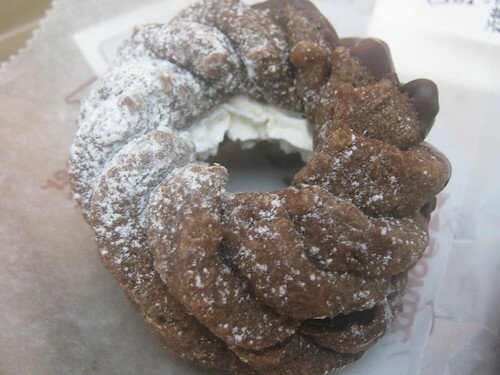 Not only did the Japanese understand that donuts should be tasty and sweet, but here they were, out-American-ing the Americans with their chocolate donut, topped with powdered sugar, and filled with cream. Just looking at that picture has probably raised your blood sugar to dangerous levels. After taking about a week off of my life just by eating that donut, I decided to climb back up to the top of The Cube to see what it’s like in the daylight and snap some shots for David. A different sight in the daylight, this is The Cube. There are folks gathering for a concert that will begin in an hour or two. 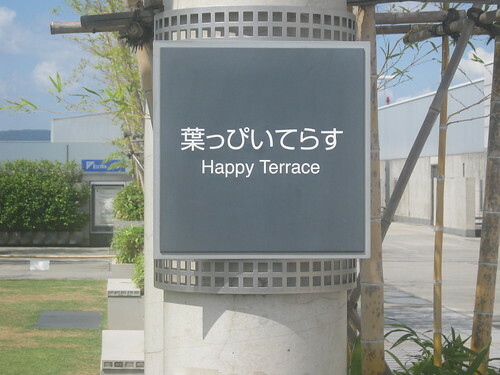 At the top was the familiar Happy Terrace, which looks completely different without the ambient light and lovers seated at the benches. Sorry folks, no creepy "happy" picture of me this time. I didn't have someone else to hold the camera. 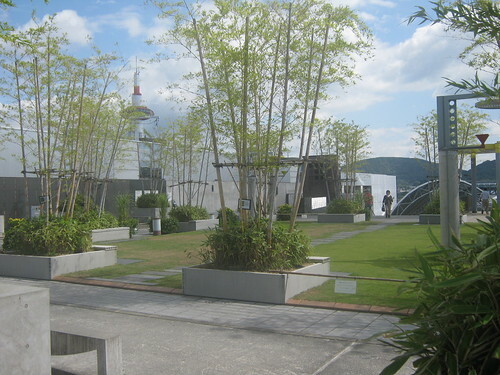 Still, it’s a completely relaxing rooftop to hang out on and I could see myself taking lunch breaks up there. 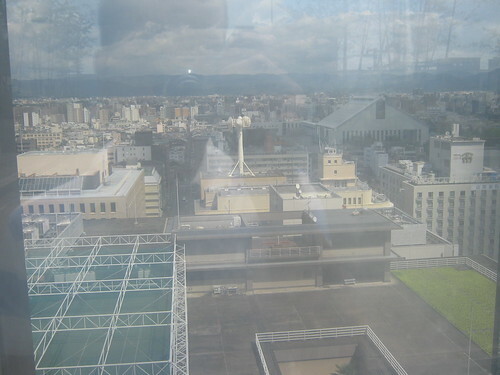 Dave and I were excited about the prospect of taking pictures of the Kyoto skyline from the top of The Cube, but it turns out that the Kyoto skyline isn’t really that interesting (to me). Thanks to my amazing photographic skills, you also get to see my ghostly reflection in the glass as a bonus. After that it was about time to start taking trains to head to Nishinomiya, so I made my way down to the platform and eventually hopped on a local line. 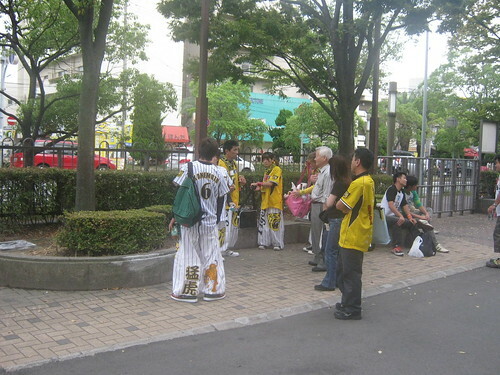 It was reassuring to see the number of Tigers fans increase the closer we got to Koshien, especially since some of them have very elaborately decorated clothing. 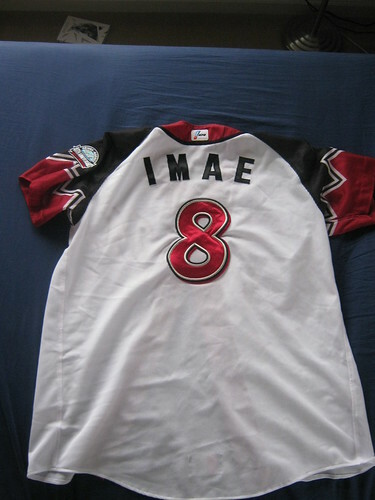 An example of an extremely customized jersey. 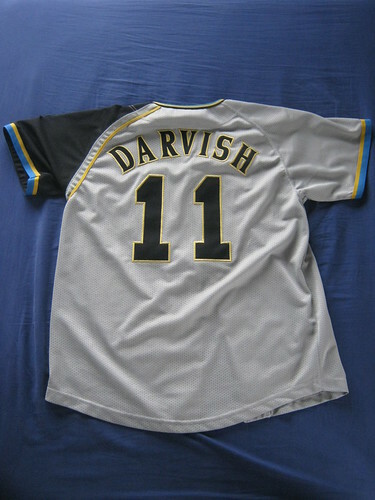 The name, number, and other patches on his jersey were all hand-sewn (or ironed) on. Not content with what he already has, he seems to be shopping for more patches. We eventually reached Nishinomiya and swapped onto the Hanshin train line that conveniently (and coincidentally!) 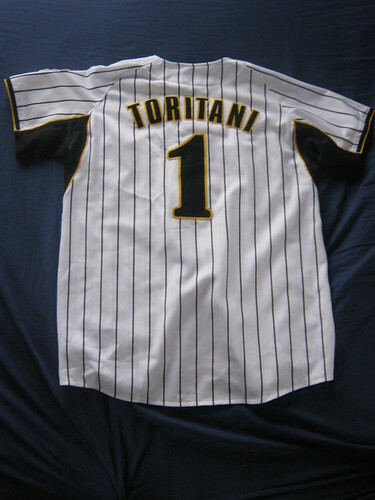 ran to Koshien where we were immediately greeted by a sea of yellow and black jerseys and merchandise, both on display and on the tons of fans in the area. 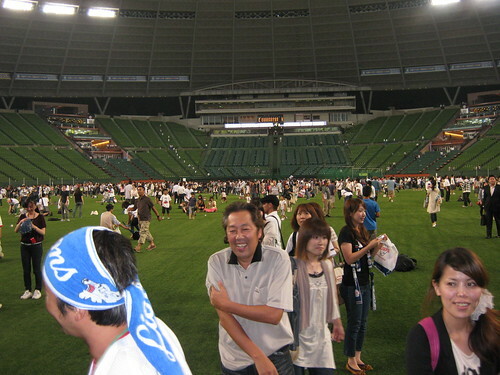 I don’t think I saw a single Baystars fan in the area. 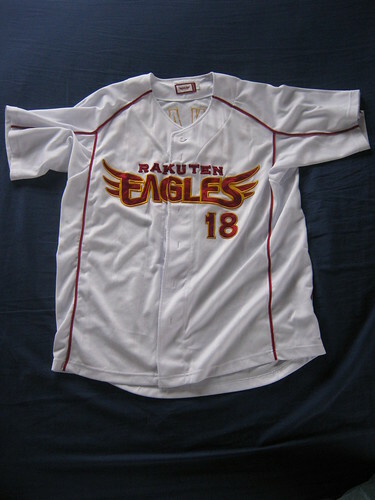 I made my way around and eventually bought a Takashi Toritani jersey and an awesome super deformed patch to eventually iron or sew on at home. 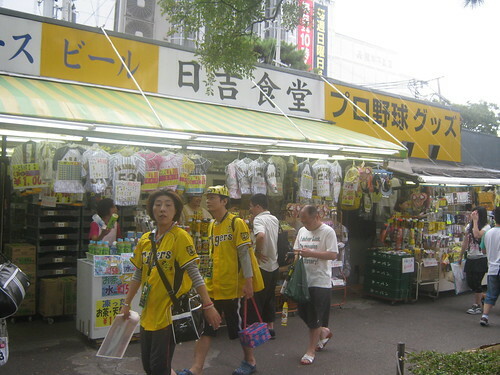 The area just outside the subway platform is lined with stalls selling all kinds of Tigers gear. 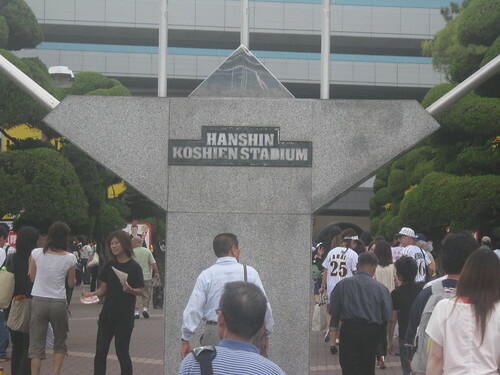 One of the most interesting things about Koshien Stadium is that there is a shrine just next door. Even more interesting is that this shrine seems to cater to baseball-related prayers. 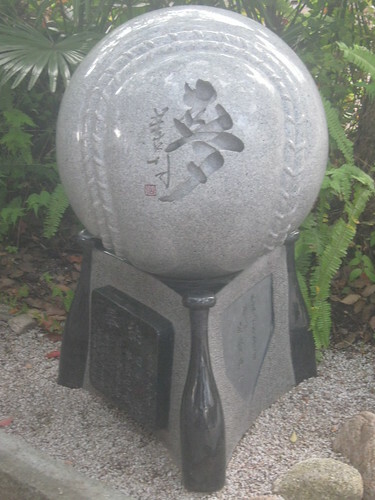 A baseball-themed statue housed within the shrine. 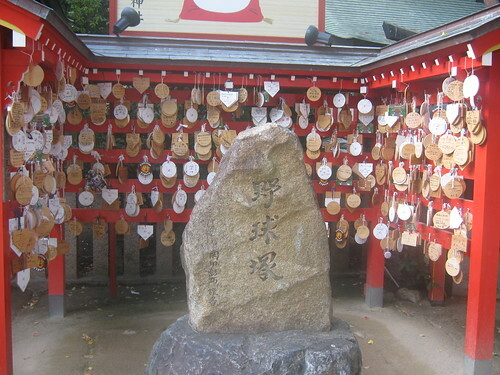 For those unfamiliar with Shinto traditions (as I am), worshippers are able to go to shrines, purchase ema, wooden plaques for prayers and wishes, and pin them to the prayer/wish board. I’m oversimplifying, but that’s the basic idea (you can learn more from the wiki link I put up earlier or through your own research). 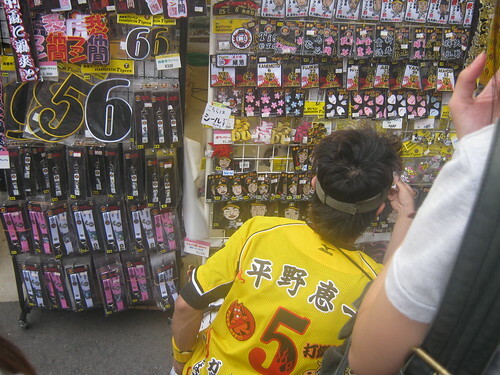 Most of the ema for sale at this shrine are baseball and/or Tigers-related. I’ve been told that many of these boards are prayers for the Tigers to succeed. I think that’s way cool. I don't think I can spot a single non-baseball-related ema. If there’s one thing I absolutely love about Tigers fans, its those loose, flowing pants they love to wear. 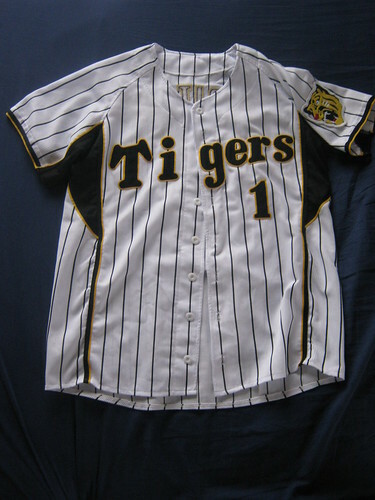 They’re typically yellow, white with pinstripes, or black, and they also typically feature pictures of Tigers or sewn on patches. 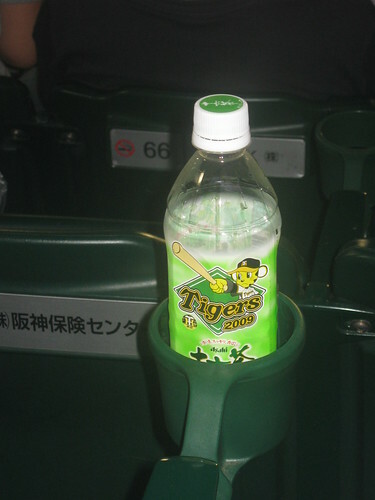 The Tigers definitely have my favorite fans in all of Japan. It's a long-distance shot, but you can see a few pairs of Tigers pants in this shot. 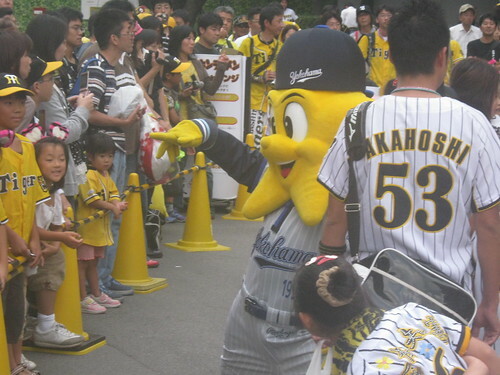 While it’s not totally unheard of to see a rival mascot at a ballpark (see the Buffaloes game for reference), I don’t think I’ve ever seen the rival mascots posing for pictures around the rabid fans of the home squad. I'm hoping that I missed the part where they all boo him and throw fruit at him. Worse still, I saw the opposing mascots hanging out together! Now here's a couple of Benedict Arnolds. Shameful. 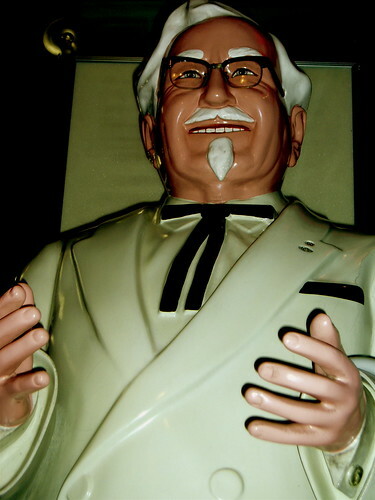 This is the scariest picture of the Colonel I've ever seen. There are a few American fast food franchises that have made it big in Japan and Kentucky Fried Chicken is one of the bigger ones. 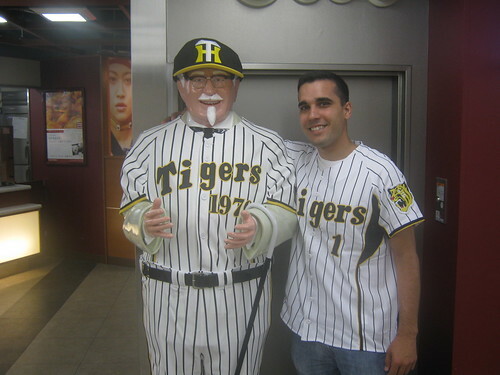 While locations in America have all but abandoned the Colonel statue as a fixture of their stores, just about every KFC I’ve ever seen in Japan has themselves a statue of the famous Colonel Sanders, sometimes dressed up for whatever location he’s occupying. One such Colonel Sanders, lightly decorated in Lions garb. The story goes like this: After finally winning their first Japan Series (the Tigers were founded in 1935) in 1985, the fans, already rabid without a reason to celebrate, went absolutely crazy to celebrate the victory. As the mob made its way to Ebisubashi Bridge, they began a pretty cool ritual where they called out a player’s name and a member of the mob who looked like him would jump into the canal the bridge spanned. Unfortunately for the Tigers, not one of the Japanese fans looked like one of the key components to their championship team, Randy Bass. 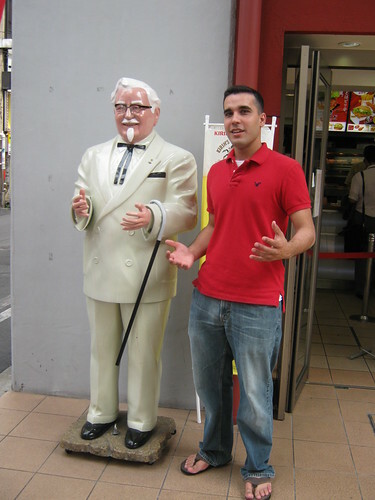 Since all gaijin look alike anyway and, more importantly, the Colonel had a beard, one rabid fan grabbed a Sanders statue from a local KFC and tossed it into the canal in place of an actual person. 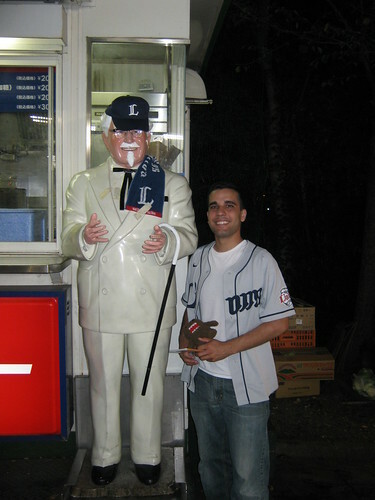 Little did he know that this casual disregard for the property of a KFC would anger the spirit of Colonel Harland Sanders, cursing the team to failure until the day they finally recovered the statue. You know, he doesn't seem all that much like a vindictive evil spirit to me. As I said earlier, the team has really only come close to even approaching a Japan Series title once in 24 years, with most of the other seasons ending in last or near-last place. The moral of the story, never anger the spirit of a chicken-loving Southern gentleman. You can dress him up in your team's colors all you want, but that won't guarantee he'll come around. There is hope for Tigers fans who actually believe in curses. Just this year, on 10 March, the upper-body of the cursed Colonel statue was located while completing a beautification project on the Dōtonbori River. The right hand and the lower-body were located the next day, but his glasses and left hand remain at large. What does this mean for Tigers fans hoping for a return to glory after 24 years? So far, nothing. 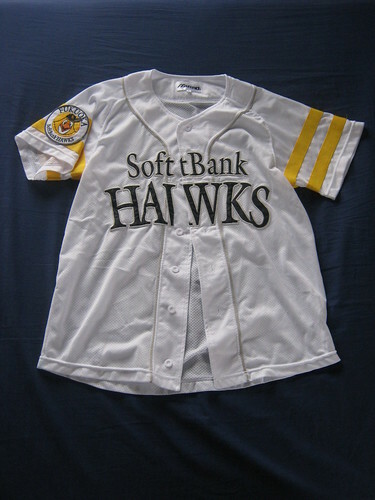 Despite a weak start to the season, the Tigers were in serious contention for the Climax Series up until their last game with the Swallows. 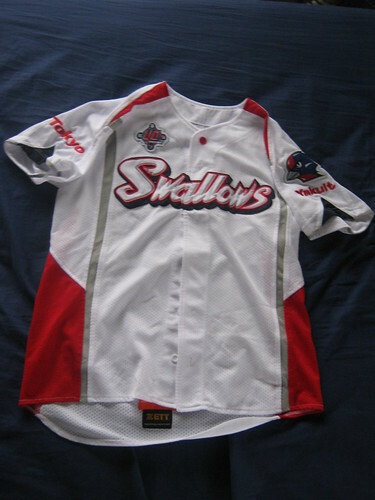 Unfortunately, the Swallows were able to knock the Tigers out of the playoffs, but perhaps next year the curse will be lifted and the Tigers can once again win a series. 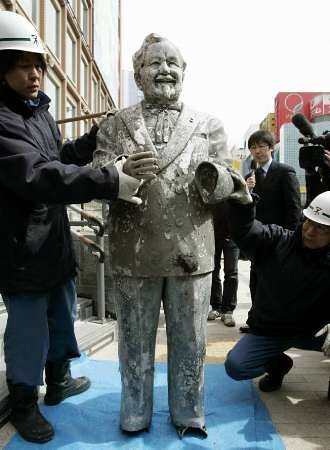 After spending 24 years in the drink, this Colonel statue looks surprisingly...who am I kidding, it looks disgusting. 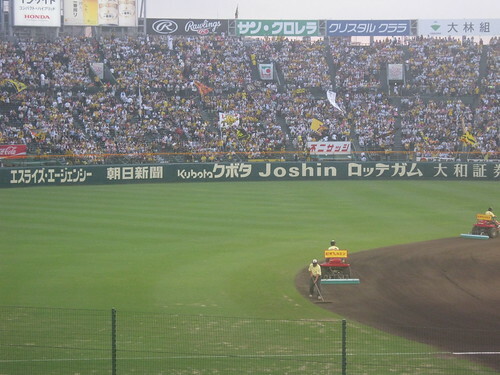 Koshien Stadium is, thankfully, one of three ballparks with actual grass growing in them (Skymark and Mazda are the other two) and it features an all-dirt infield that it seems like they over-water before the game. You can tell it's real because it's patchy. Don't they have groundskeepers to take care of that? The fans at Koshien are definitely dominant and so rabid, but I was legitimately shocked at how tiny the cheer section that was allotted to the Baystars was. Unlike other ballparks which give whole sections of the outfield, these guys were relegated to a small section. 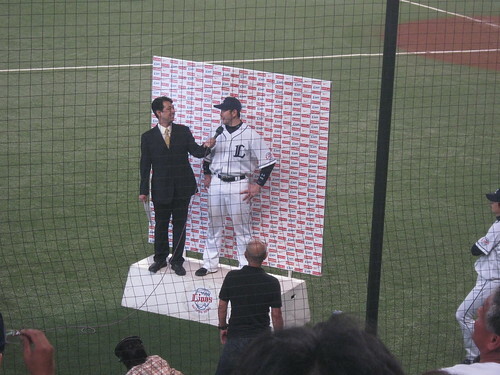 I don’t know if this is just because the Baystars are a marginal team or if this is a legitimate action by the Tigers. 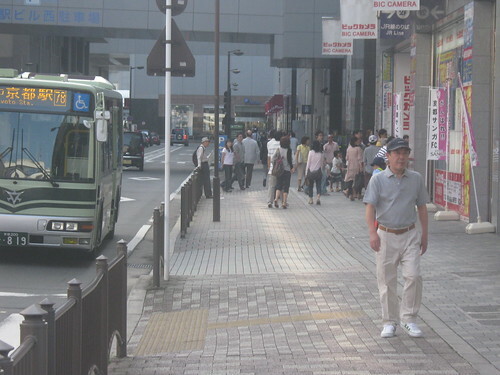 If it’s the latter, it just seems contrary to the Japanese culture of polite fairness. The most pathetic (in size) cheer section we saw on the trip. 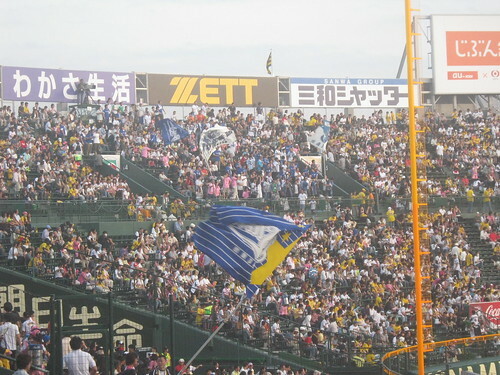 The flag is being waved by a random Baystars fan in a closer section. That night’s game featured some solid, National League-style baseball with low scoring and plenty of small ball. 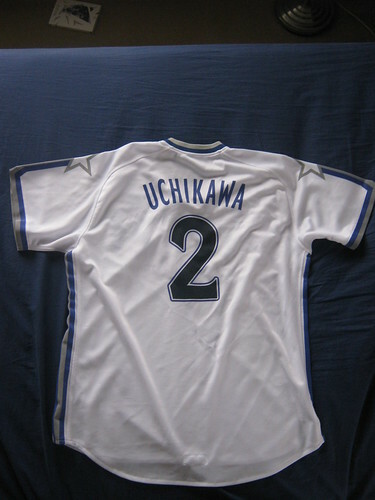 The final score was 2-1 and the ever-famous Japanese closer, Kyuji Fujikawa, came out to finish the game. Getting to see a legendary pitcher close out a game is always a plus. One post-game celebration later, we were on our way back to Kyoto!…Except that the trains were furiously backed up thanks to all the post-game traffic. Our eight-man crew braved the line for about a half hour before even getting down to the platform. The train ride was fairly uneventful, but I was told by Ken that the gaggle of women on the train to Kyoto to go out that night were not interested in me because I “wasn’t tall enough.” I hate to set these girls up for disappointment, but I’m pretty sure that I’m well over the average height for the entire country. Them’s the breaks, I guess. After we arrived in Kyoto, we all headed back to our rooms. The next day would be spent flying to Sapporo, so we had to get our rest to be up in time catch the proper trains and make our flight. It was also the final day that Jill and Nora would be on the tour, since they had to get back to their jobs at the university they worked at. Our group was down to six, but we were definitely going strong. Only four games to go. 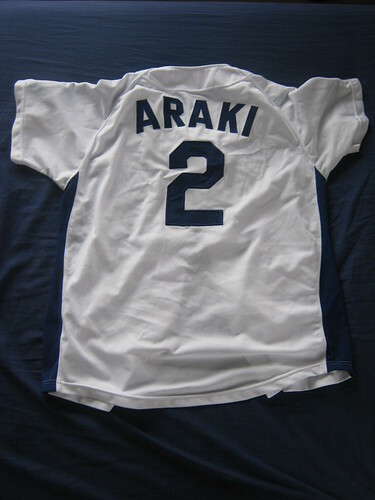 Can they finally break the curse and win the Japan Series this year? Nope. Maybe next year. 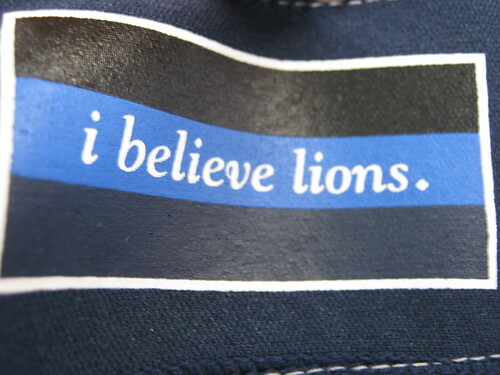 "i believe lions" was printed on the interior of the Lions jersey I bought. After an intense and draining day, it was finally time to get back to Tokyo for the last leg of the main tour and to catch some more baseball action! It’s hard not to love Hiroshima and the Chūgoku region in general. 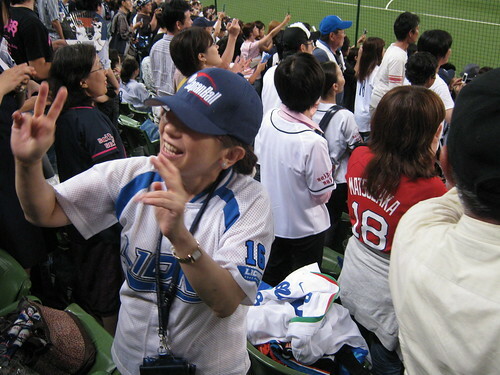 Nowhere else in Japan did I see such devotion to a baseball team as I did in Chūgoku. 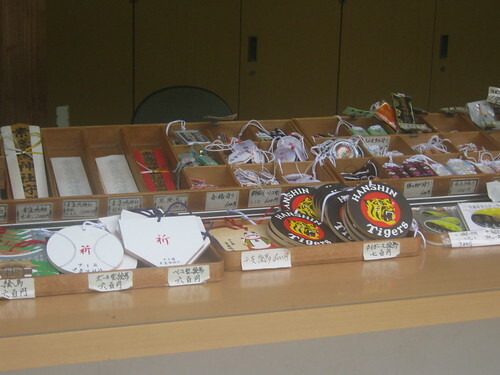 Convenience stores in both the smallest regional stations and the largest Shinkansen stations sell Hiroshima Carp tea, Hiroshima Carp trinkets, and even Hiroshima Carp onigiri. 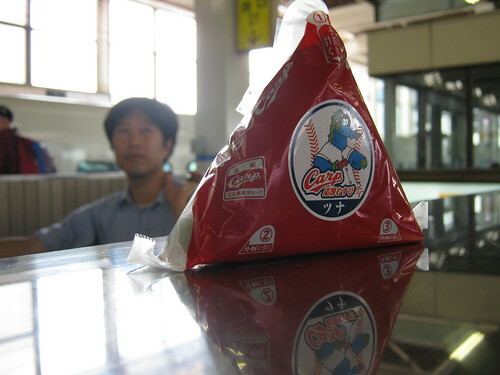 I bought Hiroshima Carp-themed food as often as possible. Gotta support my favorite team! The city had to pull itself out of extreme tragedy and I don’t think you can fault a place whose mayor personally sends a letter of protest in response to every single nuclear test that its known about since the city was reestablished. Tokyo has excitement, Kyoto has history, but Hiroshima seems to have a lot of heart and I dig that. Unfortunately, Hiroshima is far from Tokyo, so most of our day was eaten up by a bullet train back. When asked why he slept through the whole train ride, Dave responded, "There was no action." Have I mentioned that all shinkansen have snack carts that sell bentos, snacks, and drinks throughout the trip or that they’re punctual to a fault? Other than that, there’s not much to say. 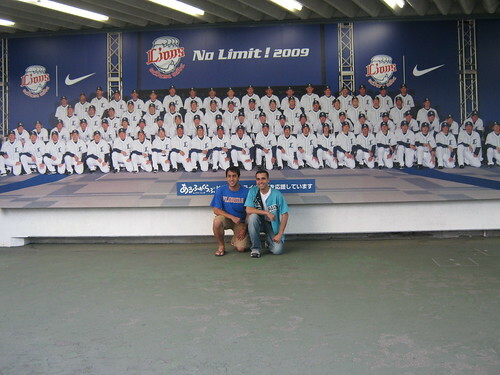 We got back to Tokyo, put our stuff down, had a bite to eat, and then began our journey to the Seibu Dome to see the Saitama Seibu Lions play. 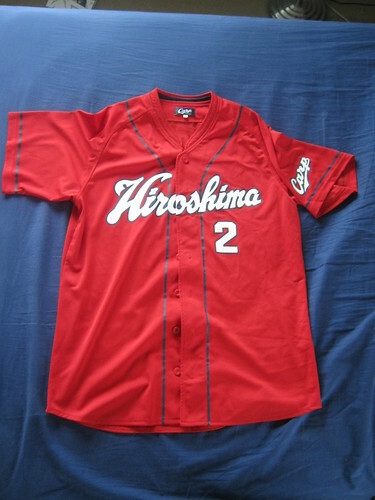 I don’t know if I’ve talked about this before, but the most fundamental difference between Japanese baseball teams and American teams has got to be the corporate ownership. Sure, there are teams in America who have corporate shareholders or who are fully owned by a company, but I think that the culture is geared more toward a single owner, like George Steinbrenner, for example, rather than huge companies. 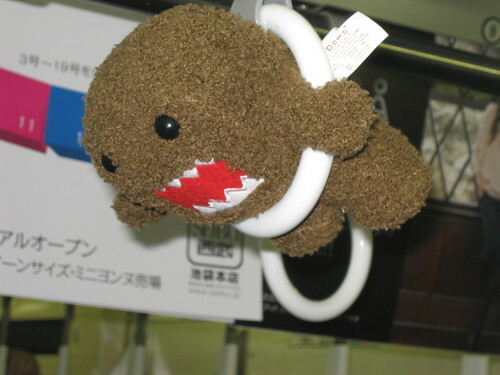 If you hadn’t guessed, it’s the opposite in Japan. The naming convention for most teams goes City/Area Name of Origin, Company Name, Team Name. So, in the case of the Lions, you have the city they’re in, Saitama, the company that runs them, Seibu, and the team name, Lions. It’s kind of complicated and it’s interesting that in most cases (the Carp excluded), the city gets left out and gets marginal billing. 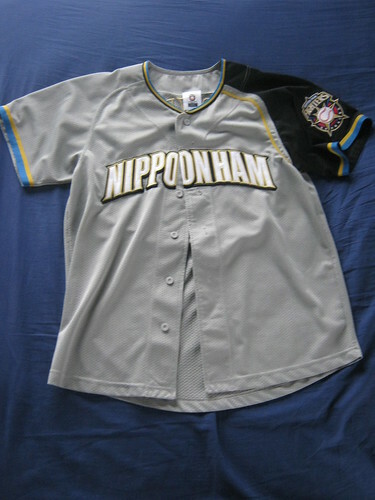 If you’ve heard of the Hokkaido Nippon-Ham Fighters, chances are you didn’t even know they were in Hokkaido, just that they were owned by Nippon-Ham (which consequently meant they had a funny name). Why do I mention this? Well, as I’ve mentioned before, it was really seeming like none of the teams had any identity in their hometown. 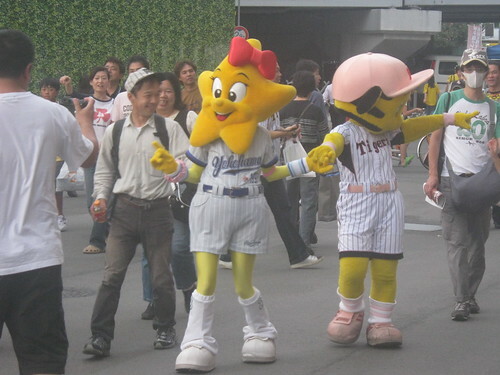 Sure, there was Tokyo Dome City for the Giants, but the area not immediately surrounding the stadium had almost no reference to the fact that the Giants played there. All that changed when I noticed a lone sign in the train station on the way to the Seibu Dome. It's not anywhere near as dirty as it sounds. Finally! A poster representing the team we were going to see! Cryptic, bizarre, and slightly sexual message notwithstanding (explanation to follow), here was evidence that someone in Saitama loved the Lions. 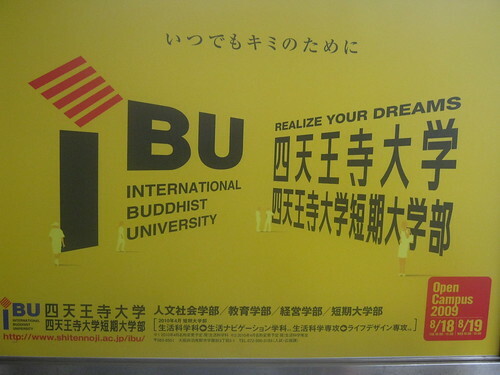 The illusion came crashing down when I remembered one key fact: I was about to board a train on the Seibu line. 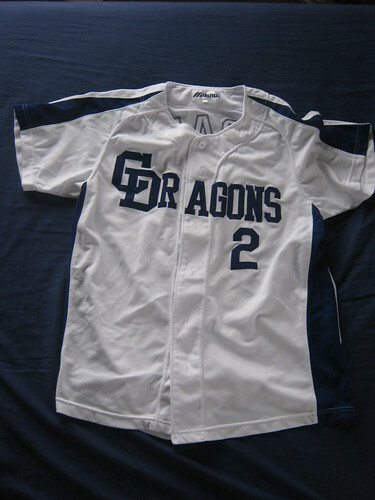 While they’re certainly not the only team to own a private rail line that stopped at its stadium, Seibu was cheating, at least in terms of what I was looking for. Of course the company that owns the baseball team is going to advertise its team on the train that will eventually lead to its stadium. 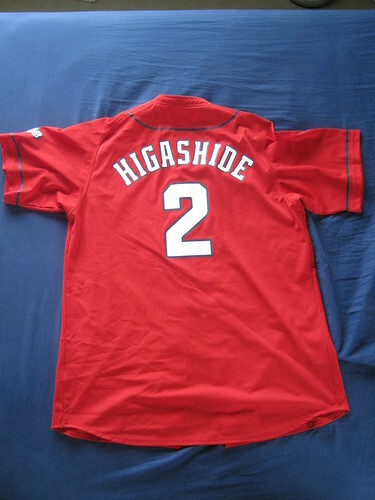 So, again, unlike Hiroshima, this was not a region that clearly adored its team, with decent reason, I suppose. 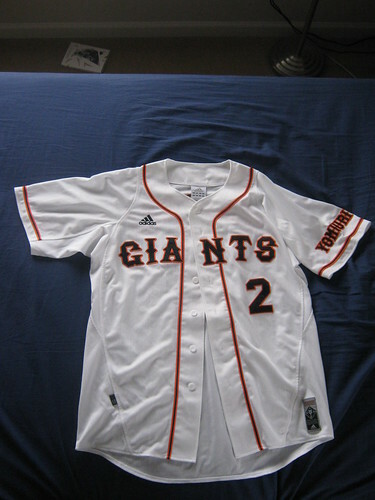 Tokyo is a complicated city to love a team in, considering that there are four teams within a reasonable distance to root for (and most root for the Giants). Now to address the poster. The playoff series in Japan is called the Climax Series. 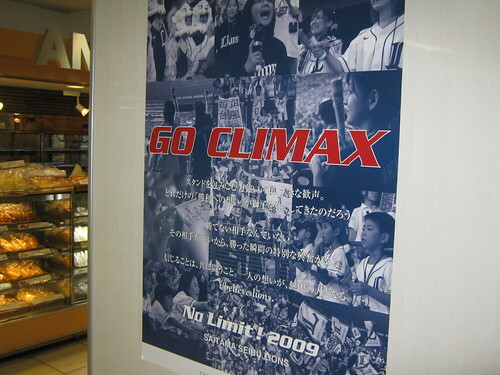 It makes sense when you think of the definition of climax, but it’s one of those things that you’d never see in the states without eliciting laughter (like when they tried to bring Calpis (read it aloud) to the states). 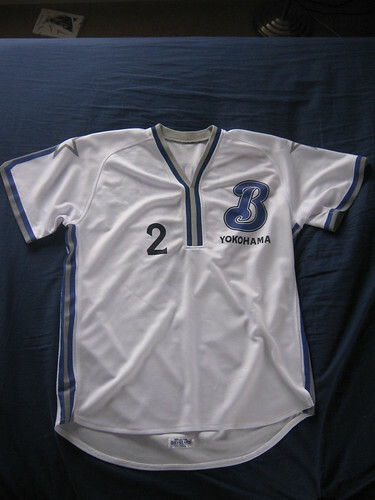 The Climax Series is also unique in that, unlike the way it’s done in the states, it has only three teams competing in each league. The first place team gets a bye while the second and third slog it out in a best of 3. The next stage is a best of seven, but the first place team starts off with one win to reward their excellent play in the regular season. After that they play the Japan Series, which is the Japanese version of the World Series (also best of seven, but with no advantages). On the Seibu line, we met some fellow baseball fans en route to the park. One of the fans was so devoted to the Lions that she had her toenails painted blue to show her support. The other girl was a closet Fighters fan who loved Yu Darvish, but explained that he just came off the DL, so he wouldn’t be pitching in that night’s game. Save it for the athletic center! 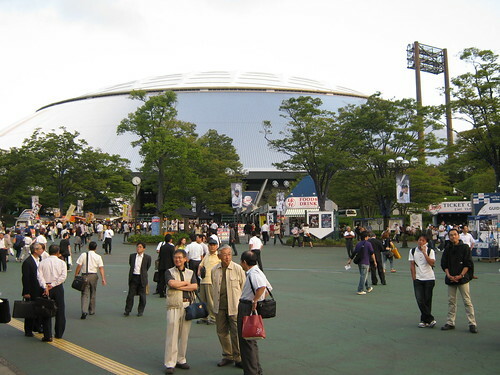 Much like Skymark Stadium, the Seibu Dome stop was immediately adjacent to the Seibu Dome (how about that? 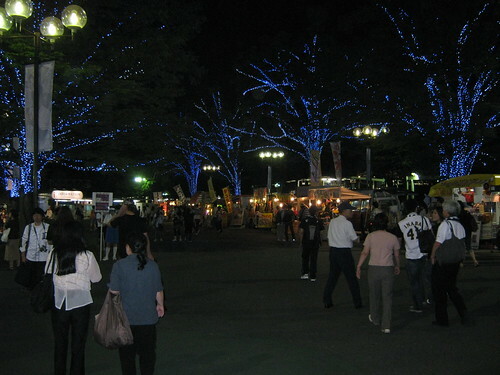 ), but the area was better decorated to reference the team with shops, stands, and blue Christmas lights. The Seibu Dome...or is it? Dave and I wandered the area, taking in the sights, and I picked up a nice Lions jersey. 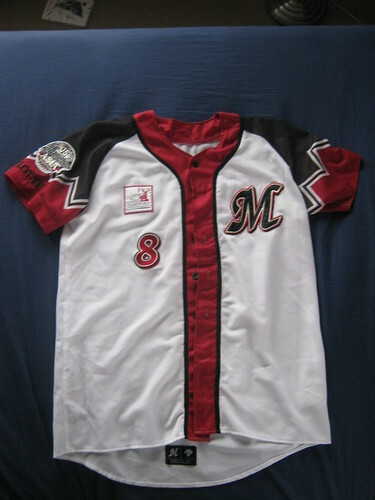 While the quality was great, it turns out that the team is sponsored by Nike, meaning the jersey was a bit pricier than I had hoped. 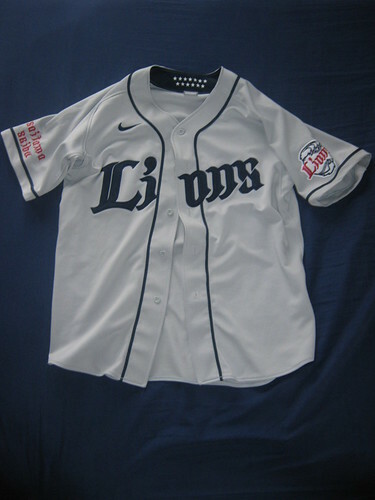 Another strange aspect of the jersey (beyond the “i believe lions” printed on the inside of the button flap) was that the armpits had “holes.” Maybe they were intended to allow better air circulation, but they’re just confusing and uncomfortable and it means you must wear an undershirt with the jersey, unless you want hair poking out of your underarms. The Lions recognize good talent when they see it. Dave and I were immediately drafted onto the roster when we arrived. If you were paying attention to the captions, you’ll notice that I implied that the Seibu Dome was not actually a dome, and that’s with good reason. Instead of the hermetically-sealed, ears-pop-when-you-enter style dome that I experienced in Tokyo, this “dome” was simply a covering that went over the field. It was more like an umbrella than a dome. The stadium was open-air, more or less, aside from the non-retractable roof. This creates an interesting effect, according to a fellow tourgoer who lives on Yakota AFB and has adopted the Lions as his team, where the climate control performs terribly. On cold days, it’s unbearably cold while the real scorchers just feel even hotter underneath the canopy. If you look closely, you can see the outside! The Seibu Dome is a bizarre stadium construction, without a doubt. It feels more like a college ballpark or something you’d watch a dolphin show at Sea World in than a real baseball stadium, but that makes more sense when some context about the team is made clearer. 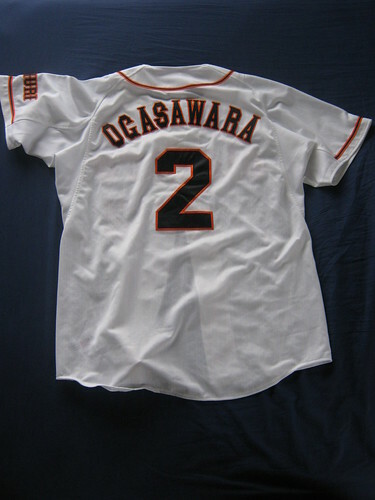 Up until the Lions got 50 M$ (I believe (lions) that’s the figure) for posting Daisuke Matsuzaka to the Boston Red Sox, the teams financial situation had been relatively dire. It’s only natural that the ballpark be so strange when it was open air at first (no doubt cost considerations went into that) and that it not be converted to a real dome when the canopy was deemed necessary. That’s really part of the charm of baseball, when you think about it. The game is played with a standard set of rules in considerably non-standard locations. Posing for a shot with Dave. Frequent readers know I really don’t like dome baseball, but the Dome brings the best of both worlds, to the degree that one can have such a thing, by doing neither very well. I’d still prefer the pure, unhindered air on my face, but it definitely wasn’t as bad as the Tokyo Dome, so I can’t complain too much. The start of the game heralded in something I’d yet to see in three Japanese baseball games, the Japanese national anthem. Jet lag may have prevented me from noticing at the first ballgame, but I quickly caught on to the fact that there didn’t seem to be a requirement to play the anthem before the game in these parts. I learned that the Japanese have a short national anthem too and that they seem to have different people come out and sing at each game, just like the ballparks in the states. 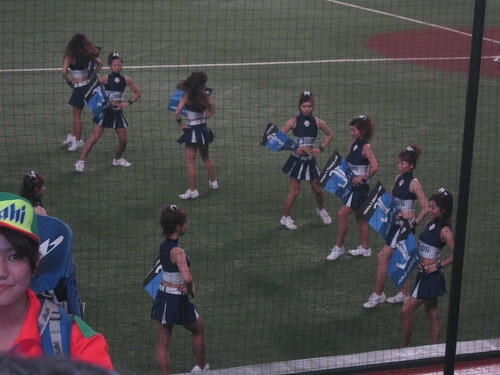 They may not play their national anthem, but they do have cheerleaders and beer girls. 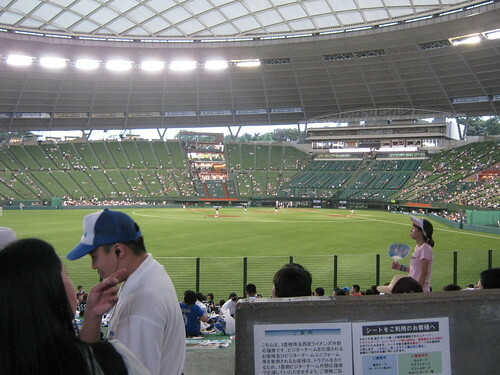 Much like Skymark Stadium, the Seibu Dome seemed to be pretty empty, which was strange considering that, unlike the Buffaloes, the Lions were in serious contention for the Climax Series. I’ll chalk the low attendance up to it being a Tuesday and leave it at that for now. Another interesting note is that their mascot resembles a grown up Kimba. 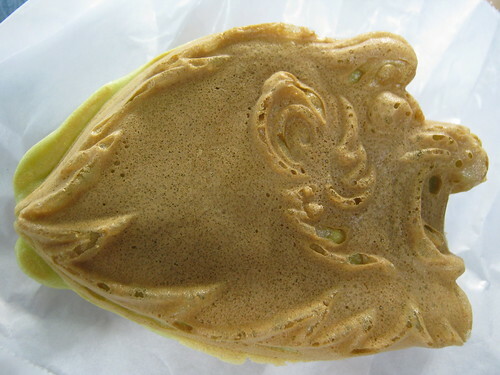 This is a cookie, but if you colored it all white, it would look more like the mascot who looks like Kimba. 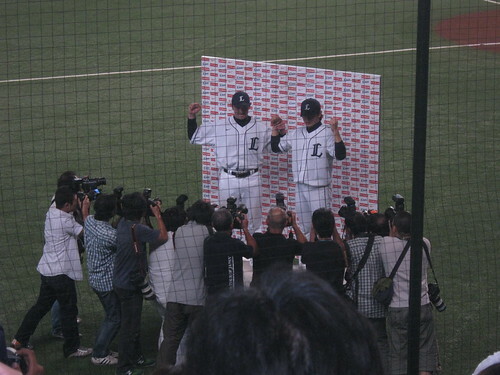 The reduced numbers didn’t prevent the Lions from displaying the same team pride and some of the raucous behavior I witnessed at the Carp game. Perhaps it’s due to alcohol, but there seemed to be an increasing number of fans who were more into it than others. Fans who yelled out things at players that weren’t synced up with cheers. It’s quite easy to drink too much at an American ballgame, but when you consider that the drinks keep flowing in Japan, even beyond the 7th inning (or two hours), you see that it’s easy to get that much wilder after your latest beer in the 9th. 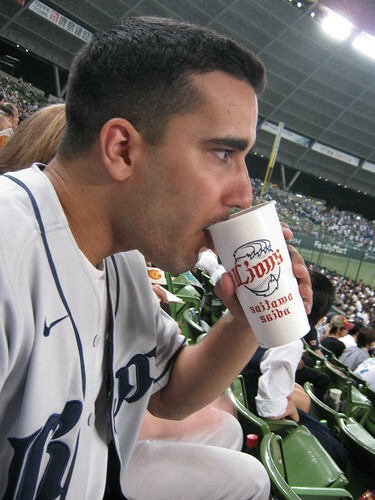 A shot of me enjoying a fine drink at the Seibu Dome. Also worth noting, the drink selection is not limited to beer. Most ballparks also have some serious hard alcohol being vended alongside the beer. At our first game in the Tokyo Dome, Mayumi and a guest bought some umeshu, plum wine, there’s plenty of soju, another rice alcohol from Korea, and I even got my hands on a delicious whiskey sour-type drink at the Lions game that packed quite a punch. We made fast friends with this couple. She gave us a banner as a gift. I don’t really have any new observations about the game itself, but it was notable in that it was the first home team victory we had on the tour so far. Thanks to that victory, we also got to see something that they definitely don’t do in the states, the on-field interview. The players of the game are usually rounded up and interviewed on the big screen for the fans that remain. Following the interview and a quick photo shoot, the players throw balls into the stands for the fans and head into the locker room. 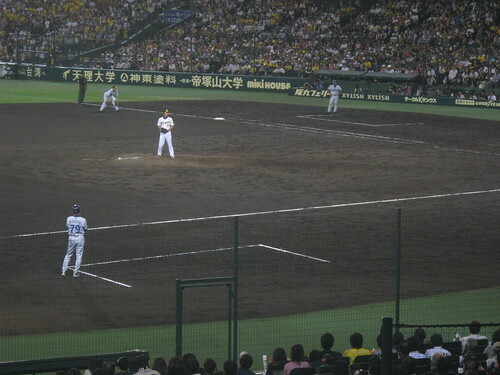 Another unique feature of the Seibu Dome is that they allow the fans to run the bases and toss the ball around the field after the game. Fans celebrating on the field. After we got our fill, we headed back to the hotel. 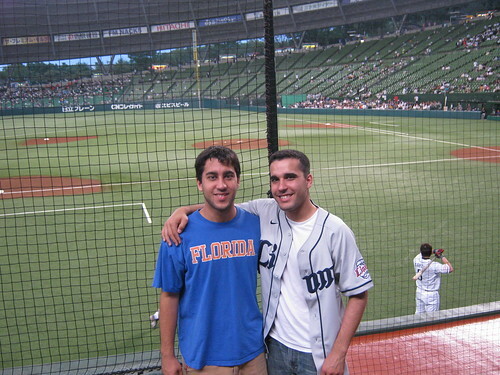 It was the penultimate full day in Japan and David and I were ready to get our fill of Tokyo before he had to go home. The area just outside the stadium at night.